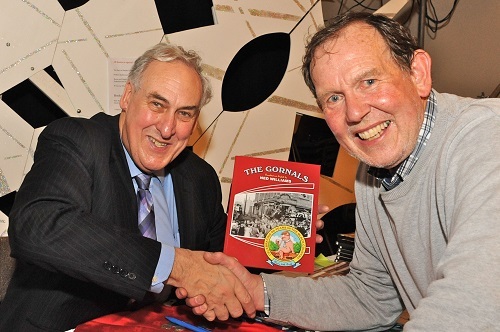 Ned Williams and photographer Graham Beckley celebrate the publication of The Gornals. The inaugural Andrew Barnett & Trevor Genge Memorial Lecture takes place on Thursday 8th October at 7:30 pm in St. Andrew’s Church, Bilston Street, Sedgley. The speaker is Ned Williams the well-respected Black Country historian and author. Ned explores the Gornals (the subject of his fiftieth book) and shares his warm affection for the villagers and their traditions. This illustrated presentation reflects a flavour of Black Country life still around, but fast disappearing. For past and present Gornal folk, it is an evening not to be missed. Schoolteachers, Andrew Barnett and Trevor Genge, were co-founders of the Society in 1984. Andrew launched the Sedgley Local History Museum (closed 2004) and Trevor published five books on the Sedgley Manor villages. Both were avid researchers and staunch supporters of conservation projects. Visit Sedgley Local History Society for more information.